Wilkes-Barre, PA – Driver Matt Kakaley and trainer Ron Burke combined to take two of the four $15,000 first preliminaries in the Bobby Weiss Series for trotting distaffs during the Tuesday twilight card at The Downs at Mohegan Sun Pocono. The Cantab Hall filly Fade Into You made her 2019 debut a successful one, moving to the lead going past the grandstand the first time and continuing on to a three length victory in 1:57.3. A Pennsylvania Sire Stake winner at two, Fade Into You is owned by Burke Racing Stable LLC and Weaver Bruscemi LLC , Phil Collura, and J&TSilva – Purnel & Libby. Run Lindy Run equaled a North American season record for the division in 1:56.4 this evening at The Downs at Mohegan Sun Pocono. Curtis Salonick photo. A race previous, Kakaley/Burke unveiled another nice sophomore making her 2019 bow, Run Lindy Run, who prevailed by two lengths in 1:56.4, which equaled the North American season’s record for the division. Another daughter of Cantab Hall, Run Lindy Run also grabbed command early and continued nicely to the wire for Burke Racing Stable LLC. 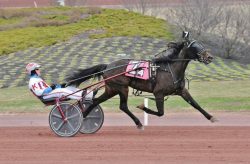 That 1:56.4 season’s record had been established at Pocono on March 19 by Spring In Paris, and that Explosive Matter filly ran her seasonal scoreboard to two-for-two in winning another Weiss section in 1:57.1. Spring In Paris had opened a good-sized lead around the far turn, but then was called upon to handle a late rush by Altercation, which she did by a neck for driver Andrew McCarthy, trainer Steve LeBlanc, and the ownership of Leblanc Racing Inc., Glenn Dyke, and Douglas Johnson. Another daughter of Explosive Matter, the four-year-old mare Moshannon Magic, shipped over from The Meadows and immediately established good local form by winning in 1:59. George Napolitano Jr. guided Moshannon Magic first-over, and she trotted her own last half in 57.2 to catch favored pacesetter Royal Esteem by ¾ of a length for trainer Ray Romanetti and owner/wife Lori. Matt Kakaley, who in all had four winners on the card, also had sulky duty behind the World On Rocknroll mare Clarebear, who took the $14,000 distaff fast-class pace in 1:51.4 by two lengths. Sheldon Powell conditions the winner of $229,788 for Rushcreek Stables.